The 2017 season was a real learning experience for me, and I had a number of firsts throughout the year. One of those firsts was having a teammate. For the first time, our Racing Analytics team expanded to include two cars in the Global Mazda MX-5 Cup Series. Soon, I’ll be experiencing another first: having co-drivers! And if you’re wondering, yes, there is a big difference between a teammate and a co-driver. A teammate is on your team but drives their own car. You’re committed to each other, but ultimately you’re each running your own race. A co-driver is someone who shares the same race car with you, so you share every loss or victory together. There are a lot of benefits to having a teammate. You get to share data with each other, share experiences on the track together, take advantage of drafting opportunities, and you look out for each other in general. Of course, it’s important to make sure you have the right teammate. You don’t want to be sharing a tent, data, and every moment with just anyone. You want to find someone with qualities that will make a race weekend more productive and enjoyable. A teammate should have a good temper, take responsibility for their actions, be willing to cooperate with their fellow teammates, and follow through on what they say they’re going to do. They remember that you are a team, and a team is equivalent to being family because you spend so much time together. And remember: if you’re going to be someone’s teammate, drop your ego before you go in, because there is no room for ego on a team! You can’t think of your teammate as competition. As a driver, you have to remember you’re there to help each other. You’re not competitors until you are first and second on the last lap, battling for the win. Otherwise, you’re helping each other on and off the track! You and your teammate are there to support each other, not just on the track but emotionally and mentally. Yes, we all have bad weekends, but we’re all so fortunate to be doing this sport and have to remember to have compassion, patience, and a shared goal for the weekend’s outcome. It’s important for both you and your teammate to have those qualities. The qualities you look for in a teammate are similar to the qualities you look for in a co-driver. 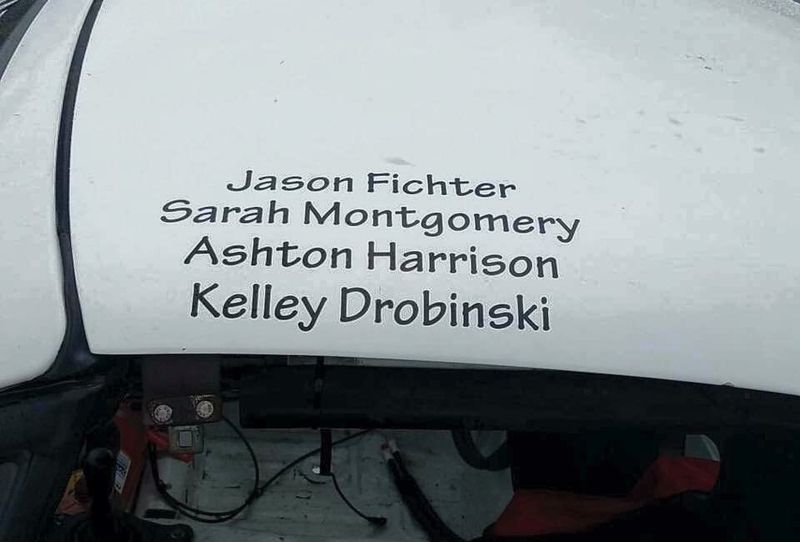 This weekend, Sarah Montgomery and I will co-drive in a Chump Car race with Kelly Drobinski and Jason Fichter. Sarah and I have been racing together for two years now, and we have found that we have the same attitude and the positive outlook: we’re both emotionally connected to the car, the team and each other. We know how to communicate clearly and we have the same goals. Sarah and I both want to have careers in professional racing, and we are committed to helping each other achieve that. The Chump Car race will be at Atlanta Motorsports Park, which is the home track for Kelly and me. We’ll have an eight-hour race on Saturday, and another eight-hour race on Sunday. It’s perfect timing because this will help me prepare for the 25 Hours of Thunderhill in December. It’s going to be lots of fun, so keep an eye out for updates next week!